Dual-Scale Dairy Goat Weight Estimation Tape is 54 inches / 137 cm long and estimates weights up to 195 lbs. / 88.4 kilograms. 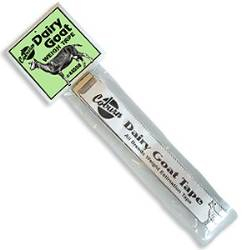 The tape works for all breeds of dairy goats and includes tips and instructions for proper use.